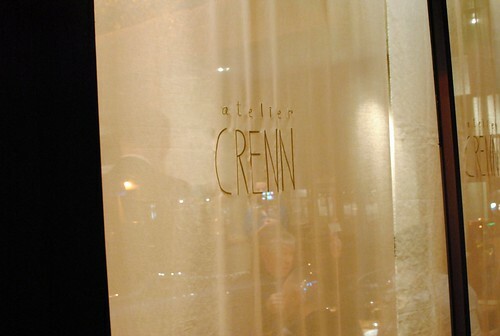 Atelier Crenn opened almost one year ago, last January. It was a hotly anticipated opening and seems to have met the hype, regarded as one of the top restaurant openings of the year (and awarded a Michelin star). The chef is Dominique Crenn, a Morrocan-French chef who grew up in France but has spent much of her culinary career in California. 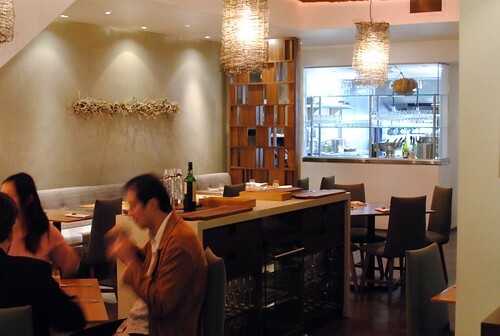 Her experience primarily spans stints in San Francisco and Los Angeles, most recently at SF’s Luce, where she garnered a Michelin star (that they’ve since retained). She left Luce early last year to focus 100% on Atelier Crenn. I’ve been following Crenn for a little while now. One of my biggest dining regrets in 2010 was missing Crenn’s one night gig at Test Kitchen (there was a conflicting dinner), but I did get to eat some of her cooking at Luce a couple weeks later. 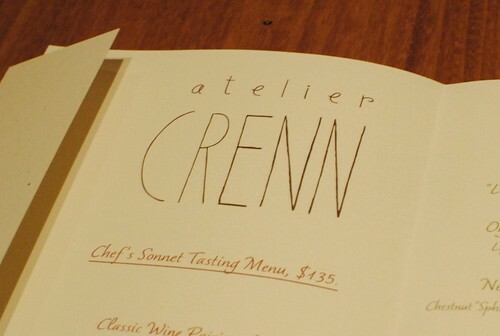 My parents dine out a fair amount and a previous visit to Atelier Crenn was one of their top SF meals of the year (for my dad, it was #1 while my mother really enjoyed Commonwealth). So, I came in with high expectations. Two menu options were available: a 5-course menu with some options or an extended tasting menu for $135 (currently $160). We went with the latter. 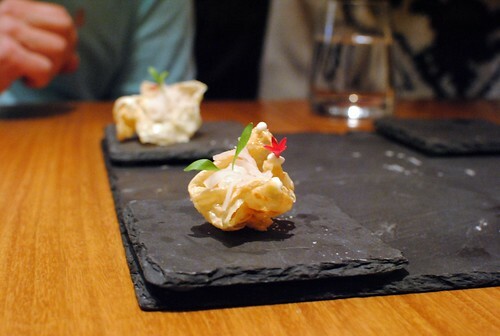 The meal started off with a trio of amuse bouche-like small bites. 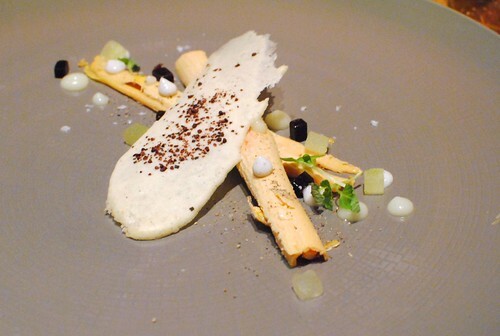 The first dish was a light and cool pear custard with frozen foie gras pearls. So pretty. 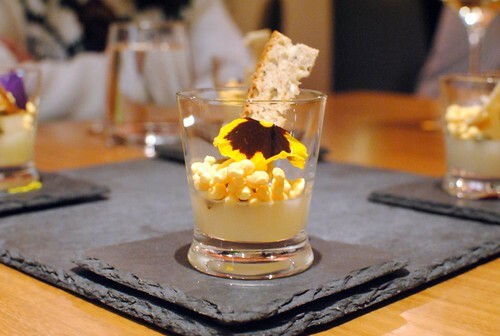 The foie pearls warmed in the mouth and became a creamy and rich complement to the sweet pear custard. Pistachios and some toasted bread added some welcome texture. A pretty nice starter, for sure. The second was a fried piece of arctic char skin. 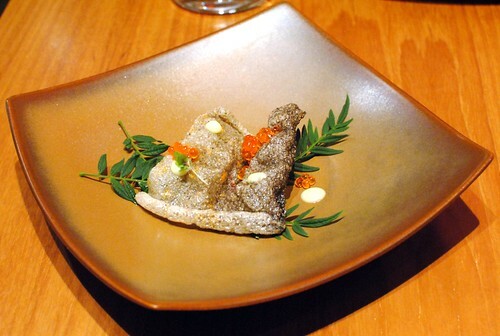 I’m not sure why I haven’t seen a standalone piece of fish skin before – delicate, crispy, fishy; it was quite tasty especially with the salty salmon roe. My mother and I were debating whether we were supposed to eat the greens – I ate it, finding it overpoweringly bitter. We later learned it was meant purely for garnish. Oops! Lastly was a fried piece of yuba with pickled daikon. I liked the crunchy yuba but found the daikon to be overly tart. 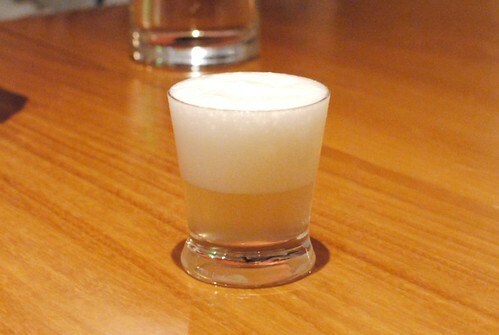 Next we had a sort of apertif – a play on a kir breton cocktail encapsulated in a delicate shell. Biting into it yielded a burst of apple flavor – refreshing and another great way to whet the appetite. Fun! Another cocktail was the drink pairing here, essentially a take on a French 75 but without the hard alcohol. These were good oysters, complemented by some Japanese accents and some herbal notes too. 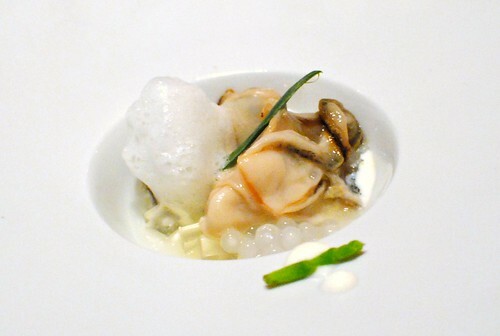 I liked biting on the chewy tapioca with the tender oysters. 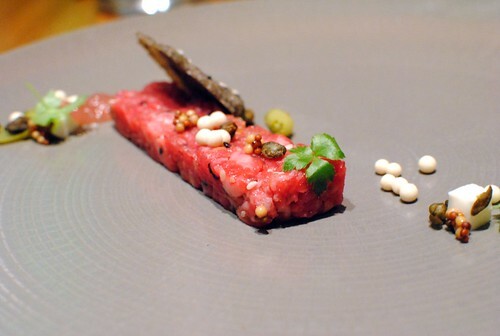 The beef was good; I thought the addition of the smoked sturgeon balls (frozen via liquid nitrogen) really elevated the dish, adding a smoky, slightly fishy flavor. The slivers of cornichon added some acidity, while the cracker added the bulk of the texture. More of a palate cleanser than an actual course, but I really enjoyed this one. 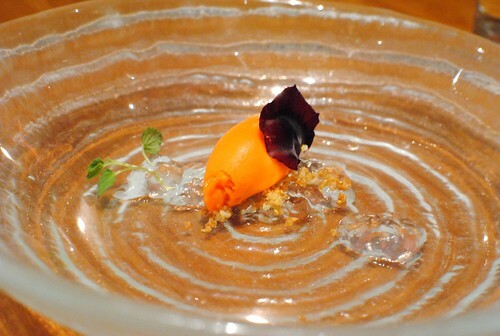 The carrot sorbet was vibrant and quite delicious. The aloe vera gelee by itself was slightly off-putting (a flavor I’m not used to), but actually helped balance the sweetness of the sorbet when eaten together. The flavors here were very subtle; the textures were more interesting. The foie had a very light, almost snow-ish texture while the cocoa nib tuile (something from Crenn’s childhood) provided a delicate crunch. 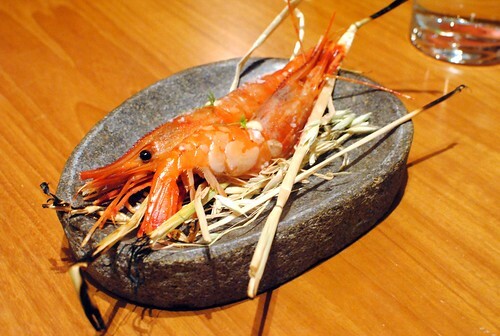 I expected these hay-smoked spot prawns to be sweet and sort of spongy. The flavors were there (accented by a smoky, grassy flavor), but I found the flesh to be rather creamy and mushy. Hm. From what I’ve read, this has been one of the most raved about dishes, and for good reason. 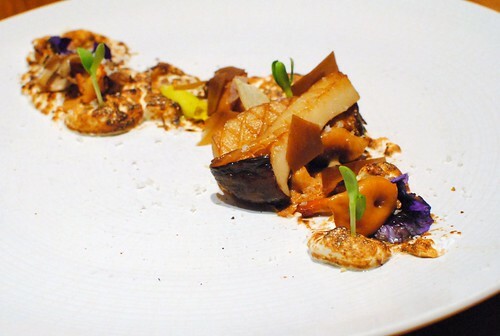 A myriad of mushrooms were carefully placed with a bruleed meringue and flowers resembling a forest landscape. While the plating was fun, the flavors were on point too with the earthy ‘shrooms and hazelnuts complimented well by the pine-scented sweetness of the meringue. I appreciated the varied textures and flavors of the different mushrooms too. 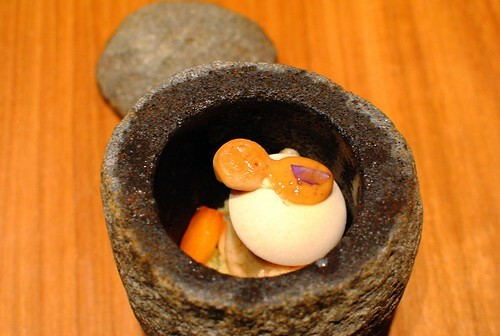 A large egg-shaped stone was plopped down on the table and opened to reveal a rather light and refreshing palate cleanser, with strong citrus flavor from the granita. 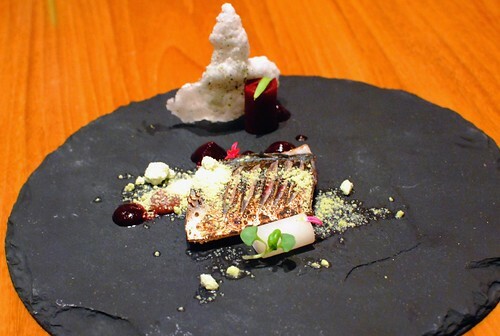 This mackerel was seared rare; the richer, oily fish was complemented by the sweetness of the beets and textures of the radish. Overall though, I didn’t find it quite as exciting as some of the other plates. I thought this fish was cooked a nice medium rare. 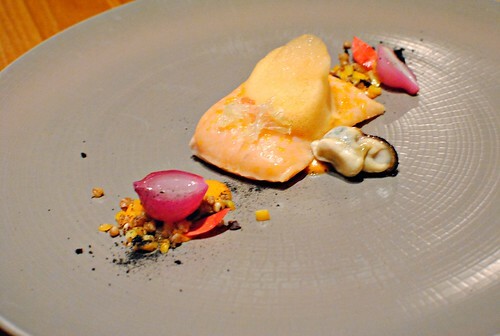 The dish had a fun flavor profile with the romesco, as well as added depth from the mussel jus foam. Pretty interesting. The lone mussel was tasty, though I’m not sure it totally fit in with the rest of the dish. 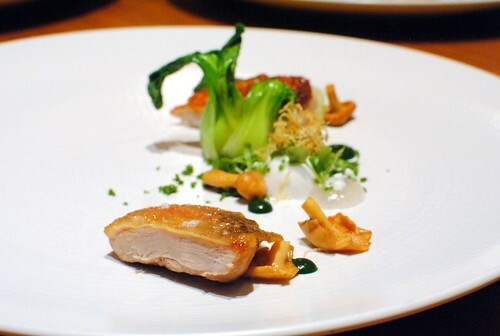 I liked the concept of this dish but thought the guinea hen was overcooked – it was on the dry side. Still, the southeast Asian flavors came through, with balanced coconut and cilantro accompaniments. Eucalpytus trees are found throughout San Francisco but I don’t think I’ve ever eaten it. Here, a little bit of eucalyptus ice cream (on a stick!) 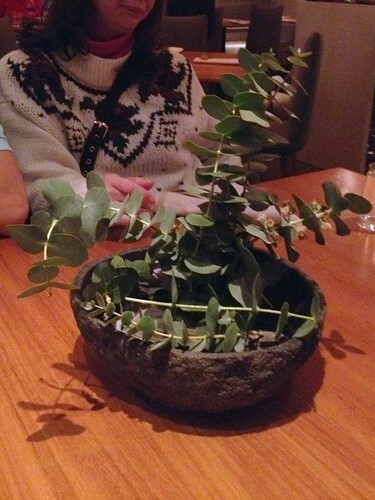 was presented under a small eucalyptus tree. How fitting. I liked the ice cream…not really woodsy at all, it actually had a bright, clean flavor. 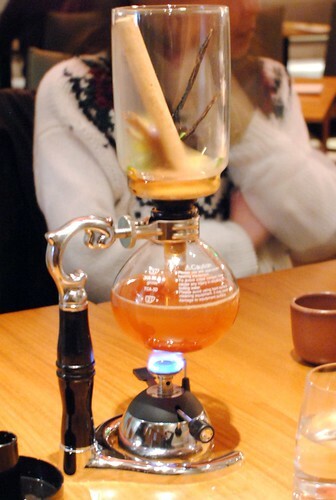 Next, a siphon came out to create a beverage pairing with dessert. 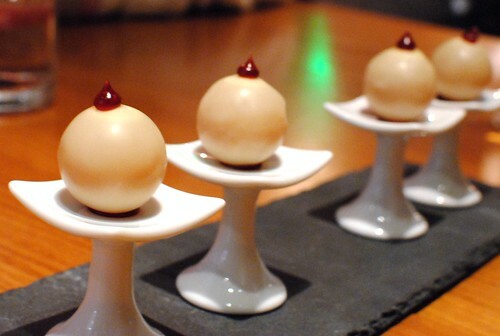 Cinnamon, vanilla bean, and star anise were infused with quince tea right at the table. Pretty cool! I thought this was a standout dish, both in presentation and flavor. 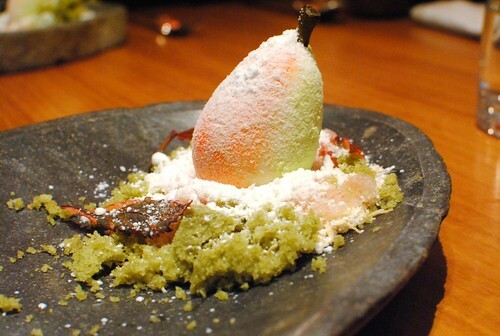 What looked like a lone pear in a snowy landscape was actually a creamy pear sorbet with wonderful delicate textures from an herbal sort of crumble. The sweet sorbet was nicely balanced by the Greek yogurt snow. As good as it looked! Lastly, we had a pretty robust selection of sweets. Atelier Crenn met my high expectations. I marveled at the creativity and personal touch/story in the menu, and this was some of the best plating I’ve ever seen. The menu showed a lot of restraint; flavors were at times subtle, but rather refined and always well-balanced. Execution-wise, I thought there were a couple of misses on the spot prawn and guinea hen, but outside of that I thought the plates were spot on. Plus, the meal showed a lot of technique throughout, working with varied textures and preparations. And seriously, that dessert was one of the most memorable plates all year. Service was very warm, attentive and accommodating. Overall, I’d say this was my best complete dining experience during my San Francisco trip and would not hesitate in returning. This looks like a really cool meal. ps: you’re going to learn how to make that tea just like the churro ice-cream sandwich, right? Agreed! And haha no! Well, I suppose the tea would be easier than the churro sandwich..
Yeah serious, that pear is something. Sounds like this may be the place for you then! Good rundown. Especially timely as you ate here a few days after Saison. I’m heading up to Atelier Crenn this Saturday. Very very excited! Thanks Daniel, looking forward to hear about your meal! Finished up a 18 course meal at Crenn. That pear dessert is forever seared into my memory. Couldn’t stop talking about it the next day. Other standout dishes I had were crab w rutabaga, grapefruit, and lovage as well as venison w coffee-vegetable ash, grilled scallion stem, and black garlic puree. Sounds like a good meal! Can’t wait to hear all about it. 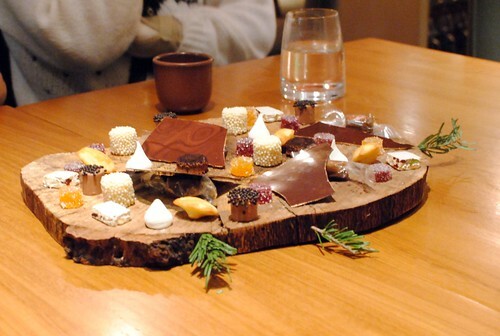 What a beautiful mignardises presentation! 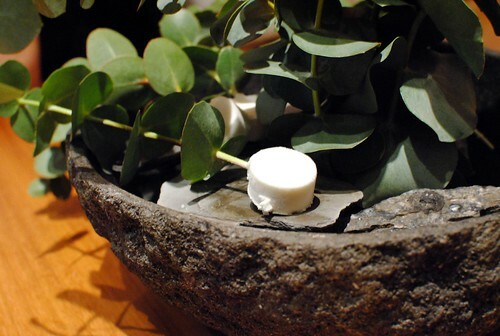 Haha yah, I’ve seen some of the mignardises presentations under a bonsai tree. The plating is something special on its own.